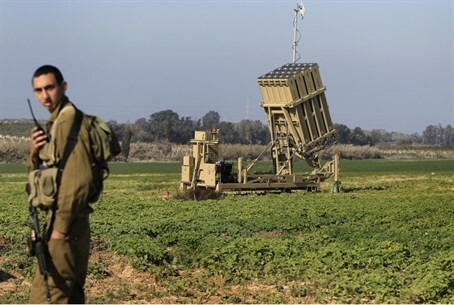 After a delay due to the escalation in the south, the Iron Dome anti-missile system is deployed in the Greater Tel Aviv area. For the first time since entering operational use, the Iron Dome battery was positioned in the greater Tel Aviv area on Monday. According to a report on the Israel Defense website, the position of the battery is for training purposes, to familiarize IDF soldiers stationed in the area with the system, and to adapt the system to the area’s requirements. According to the report in Israel Defense, the training that starts in central Israel this week was supposed to take place more than a month ago, but was postponed due to the escalation in Israel's south. During the recent escalation, the Iron Dome displayed its capabilities with a high rate of rocket interceptions. It reportedly intercepted 90 percent of missile attacks on urban centers. Terrorists fired more than 200 rockets at southern Israel during the week of escalation. Periodic rocket and mortar fire at southern Israel continues even when Gaza terrorists agree to a ‘ceasefire’.